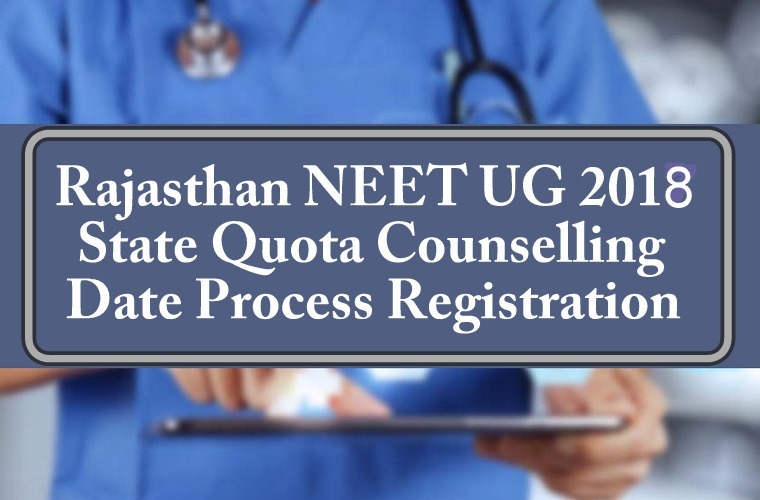 Rajasthan NEET 2018 State Quota Counselling Date: The office of the Chairman, UG Admission Board Jaipur will release the Rajasthan NEET State Quota Counselling Schedule 2018 after the announcement of NEET UG Result 2018. All candidates from Rajasthan who had appeared in NEET UG 2018 exams can fill the online registration form for the 85% seats of state quota NEET counselling. The selection process will be based on NEET 2018 state ranks. Candidates seeking admission in medical/dental courses in Rajasthan are required to fill the registration form by paying non-refundable registration fee of Rs. 2000/- (Rs. 1200/- for SC, ST category candidate of Rajasthan state domicile) + applicable e-mitra charges through Internet banking / Debit card / Credit card or at any e-Mitra CSC kiosk center (authorized by the Government of Rajasthan). Note: The registration fee is neither refundable nor transferable and not adjustable for any future State UG admissions. Any plea in this matter shall not be entertained. The Senior Secondary examination or the Indian School Certificate Examination, which is equivalent to 10+2 after a period of 12 years study, the last 2 years of study must comprise of Physics, Chemistry, Biology / Biotechnology with English as compulsory subject. The Senior Secondary examination or the Indian School Certificate Examination, which is equivalent to 10+2 after a period of 12 years study, the last 2 years of study must comprise of Physics, Chemistry, Biology with English as compulsory subject. After publication of NEET UG 2018 Result, now the Medical Counselling Committee is conducting online counselling for 15% all India MBBS & BDS seats. The 1st Round All India Quota NEET Counselling is started from 3rd July 2018. All eligible candidates have to fill the counselling registration form in order to appear in AIQ NEET Counselling 2018. Note: All these dates are tentative based on the previous year’s counselling schedule. We will publish final counselling schedule after NEET Result 2018. 1. Receipt issued by e-Mitra/ CSC Kiosk containing the Token number. 7. Certificate/ Document providing your eligibility as selected by you at the time of filling online registration form- (I to XI). 14. Bond as per the applicable Proforma. i am from punjab nd wanted to take admision in private collg for mbbs …how to register application form? Registration for counselling for rajasthan state will be separate or same of All india quota. I am from rajasthan. I did not register for mbbs counseling.I thought for state quota separate registration process will be there. Does it will be separate or not? Will be conducted Separately. Keep in touch, we will inform soon. Mera rajasthan mai konsa number hair. Registration for Govt. College & private college in raj. will be same or separate. Sir , my category is ST & during registration for state couns.(Raj.) there was no option about uploading caste cert. But in instructions provided by coun. authority caste cert. also should upload if applicable. sir, tell me any idea abt it ..did I make a mistake??? No, just make sure to have that certificate during the documents verification. Respected ma’am/ Sir, i wanted to know will there be separate procedure for 2nd round counselling after the 1st round seat allotment. Provisional Combined Merit List (Counseling) MBBS & BDS Admissions – 2016 my merit no is 5457 and in WDP my merit no is 125 so is there any chance of getting any government college. Respected ma’am/ Sir, I am from rajasthan i wanted to know will there be separate procedure for 2nd round counselling for rajasthan medical college after the 1st round seat allotment. Provisional Combined Merit List (Counseling) MBBS & BDS Admissions – 2016 my merit no is 5457 and in WDP my merit no is 125 so is there any chance of getting any government college. I have done my 11th n 12th from kota (raj) .am i eligible for state quota or does it require 10th marksheet also??? I got 565 marks in Neet 2017. Can I get a seat I govt medical colleges in Rajasthan.l have a permanent residency of Rajasthan.l belongs to unreserved ( general) category. When will the online registration process of filling counselling forms begin for state counselling for mbbs courses ? From 2nd week of July month. Sir my son has got 598 marks in General category in NEET 2017. will he get admission in SMSMC, jaipur or SNMC, Jodhpur. what is the WDP/WPP certificate and Bond as per applicable proforma? Application form.. When it will be available!!!!! i hv completed my inter from rajasthan .can i apply for rajasthan state quota registration? sir my son have marks 213 in NEET17 FROM RAJASTHAN THAN KYA CONCELLING REGISTRATION KARNA CHAHIYE? i got 454 marks in neet 2017 nd im from SC category.My category rank is 1168 .
do i have any chances of getting a government college through rajasthan state counselling??? Yes, you have. Just take part in state quota counselling. I have 404 marks in neet 2017 form SC category nd all India category rank 2907 do I have any chances of getting a government college through rajasthan state counselling nd All India 15 % quata????? do i have any chances of getting a government college through rajasthan state counselling and All India quata??? My category position in Rajasthan is 275 . I m from SC category.Do I have any chances of getting any govt medical college through state counselling?? I scored 454 in neet . FARJI COLLEGE JNU MEDICAL COLLEGE JAGATPURA JAIPUR SE BACHACHO…..PAISA LOOTNE KA GAROH HE COLLEGE TO NAM MATRA HE…. Sir kya mera registration ab Ho Sakta h.. ..
Sir. Kya 2nd round participate candidate mop up round participate kar sakta h? Sir jinko 2 round me college allot hua h kya wo b mop up round me prt le skte he?? Respected sir, My domicile rajasthan h . Mera ph 40 percent certificate sms college jaipur ka neet 2018 mein mayne hoga ya nahi pls.send me information thanks sir ji. Yes, aap PH category k through admission le sakte hain but college konsa milega ye batana mushkil hai. I got 512 marks neet 2018 OBC Rajasthan can I get govt. College of Raj. I am ST girl , domicile from rajasthan hai.I got 170 marks . Is it possible to get college in rajasthan. Can I change my categry I have send mail cbsce neet site on 19/05/2018 ,21/05/2018 and 25/05/2018. hello my daughter obtained 472 mark , cat UR , can she get gov or private college in Rajasthan. Sir I have score 472 socre in neet 2018 category UR state domecile is of Rajasthan can i get the government collage ? Govt. College aapko Ni milega, bds bams mil Jayega.private deemed college ke liye apply KR skti ho but fee buut jyada hogi. AND I WANT TO APPLY FOR RAJASTHAN STATE QUOTA(85%) COUNSELLING , SO IS THERE A CHANCE FOR GETTING ANY COLLEGE. Sir i got 280 marks with sc catagory . I get any govt medical college . my brother got 505 marks with defence quota in category 6(ex serviceman).is there any possibility to get govt medical colg in rajasthan. i got 272 marks with UR catagory. so there is a chance for getting any private collage?